The Blackville School Junior Varsity Girls Volleyball team made history on Sunday May 6. 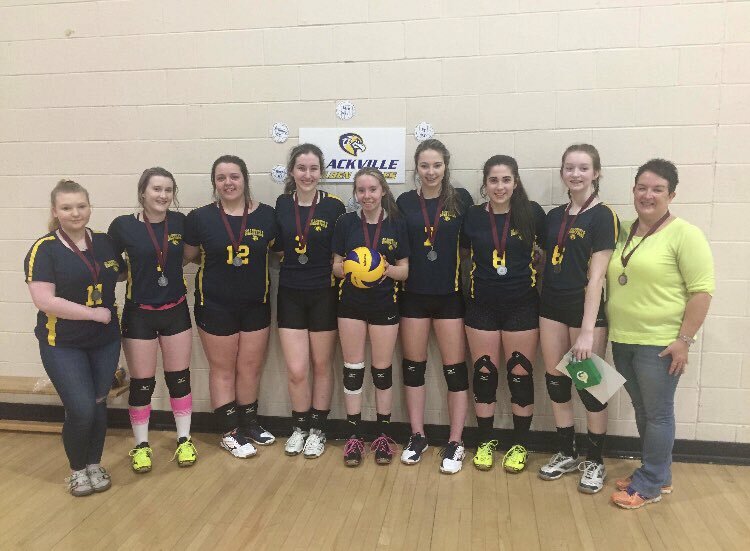 They won the first ever Volleyball Provincial Medal for Blackville School. The girls started off their season with a tough loss in the fifth set to rival NSER. Veteran players Maggie Jardine and KC Hallihan still had hope in their team and believed in their skill and ability to succeed. This enthusiasm carried over into the next 6 games against Dalhousie, Campbellton and Carrefour Beausoleil where the girls went undefeated. NSER put an end to this streak, but the girls still headed into Regionals with second place. 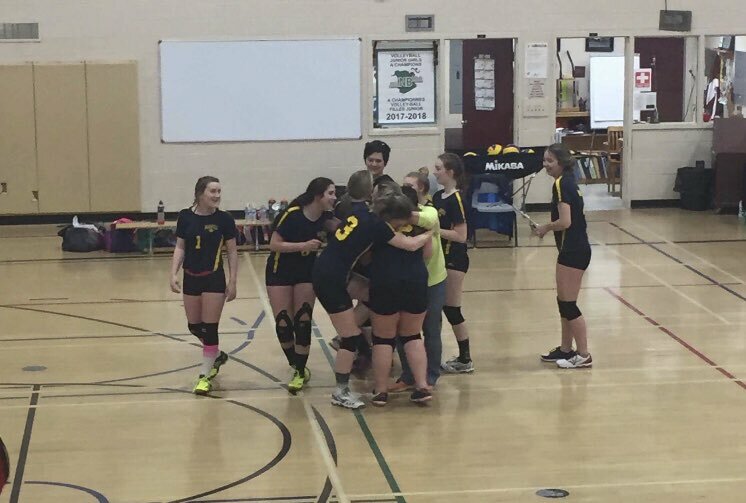 The girls showed up to play and found themselves topping Dalhousie in the fifth set 19-17 to head to Provincials in the 1st place slot. Booking their ticket to the provincial weekend did not come easy or without an abundance of hard work and dedication to the sport throughout the season. As the girls rolled into Provincials, they were set on one goal: the provincial final. They had a chance to do what no other volleyball team from our school could do before and they succeeded to the best of their ability. Each set was a challenge, but our Eagles were able to rise to the occasion and come out on top each time. Another tight game against Dalhousie landed our girls in the finals. 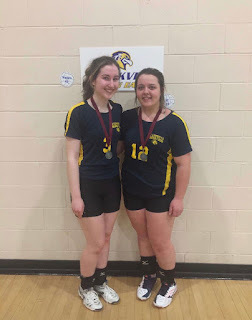 After a hard fought battle against a fast and well executed Tobique Valley team, our girls recieved a provincial silver medal, naming them the 2nd best "A" level Junior Varsity Girls Volleyball team in the Province of New Brunswick. Coaches Marilyn Underhill and Cheryl Buggie were extremely pleased with the powerhouse squad they coached this season. A congratulations is in order for the girls. Their hard work will certainly not be forgotten anytime soon. The younger players are extremely proud with their accomplishment and excited to see what next season will bring. This season was certainly one for the history books! The Varsity Girls Volleyball team also had a fantastic season, showcasing a lot of volleyball talent that our school has to offer. The girls headed into a regionals, with an exceptional season under their belts. Playing a total of 12 sets, during the regional weekend, our girls showed up to play and won 10 of those 12 sets. The girls started off the regionals, in a pool with Dalhouse, Minto and Chipman. They ended the round robin playing at the top of their pool and headed to the cross overs against long time rival NSER. 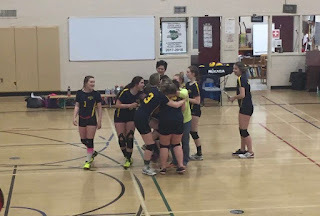 This was the most important game of the season, as the winner was headed to Provincials. Our girls didn't miss a beat, blocking, attacking and placing each and every ball correctly, landing themselves a ticket to the golden weekend. A placement game was set against Rogersville and Eagles soared, coming out on top, beating them in two straight sets. The girls are ranked number 1 in the NorthEast of the province as they head to ESN to take on one final weekend of volleyball. Senior players, Abby Donovan, Darian Donovan, Olivia Buggie, Amber Walls, and Erin Moody say they are on cloud 9. Having the chance to capture one final Provincial title is always the best way to end off their High School sporting careers. The hard work and dedication that the entire team has put into this season was shown on the court and helped our girls excel to the top of the pack. The girls are set to play Kedgewick at 12:00 on Friday May 25 at ESN. A big congratulations and good luck is sent to our girls. No matter what the outcome, our girls always leave it all out on the court and play with their hearts for the blue and gold. 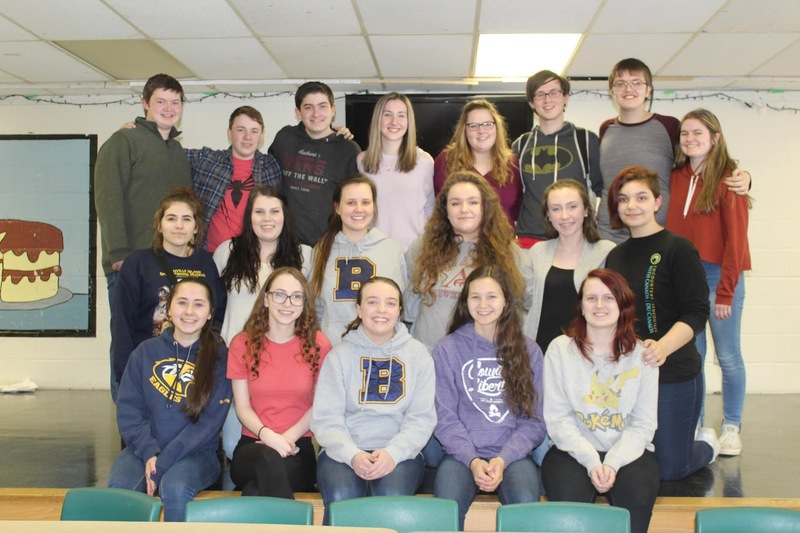 Many actors at Blackville had the chance to showcase their talents for the school on Monday, May 7. 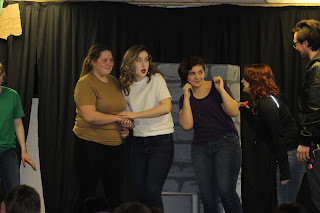 Students from the Theatre Arts 120 class and members of the High School Drama Club presented "Check Please" along with "The Maze" for parents and other students. 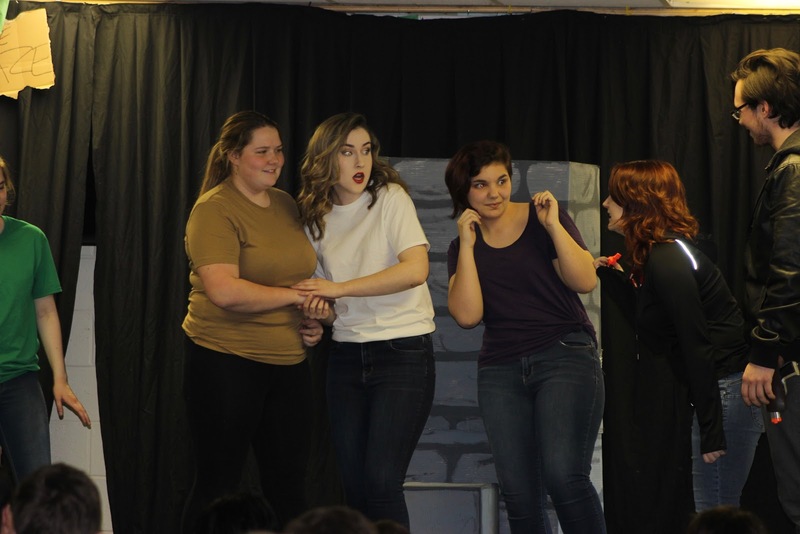 The crowd went wild with laughter as both productions were a huge success. 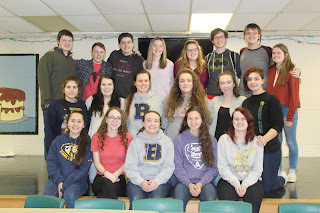 Both groups have been working hard all semester in preparation for the Annual Provincial Drama Festival, and all funds raised went to help cover expenses for the students to attend the festival this year. More photos from this event can be found here. Elementary students participated in a Spell-a-thon on Monday to raise funds for field trips and other school activities. 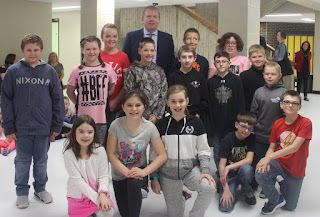 The top pledge earners were Avery Donahue in grade four who was awarded a Nintendo Switch, Nathan Stewart in grade five who was awarded a hoverboard along with a helmet, and grade five student Kyle LeBlanc who was awarded a drone. 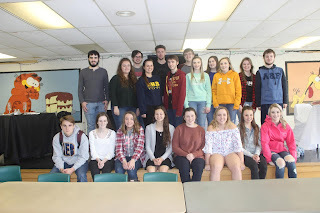 Students who spelled all their words correctly or raised $50 or more in pledges had their names entered in a draw for one of two 450 movie certificates. The winners were Ethan Sullivan in grade 4 and Turner Kenny in Kindergarten. Mrs. A Waugh's grade 5 class raised the most money. 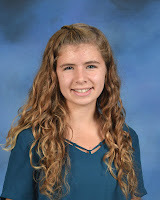 The elementary were successful in their endeavors, as the students raised over $7000 in pledges. The funds will go towards the cost of field trips and other activities.